The median skier can sort of be thought of as the “peloton”. 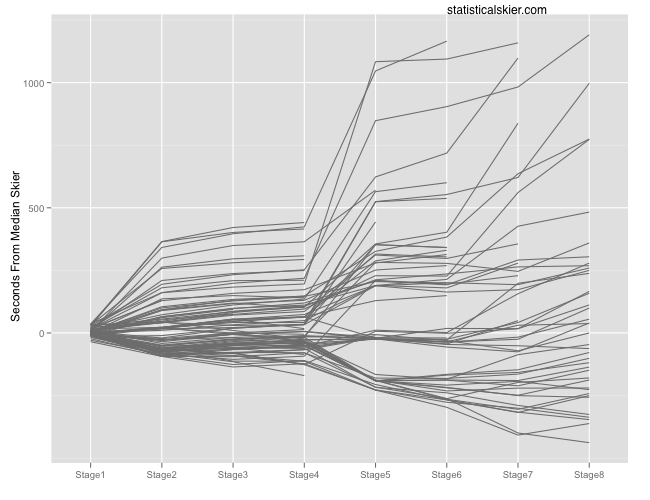 As you can see, not much happened until Stage 5, the first really long distance event of the Tour. That stage clearly split the group into three main packs, with some stragglers in the back. These groups mostly stayed together through Stage 6, but then began to drift apart in Stages 7 and 8. Emil Jönsson bagged his sprint WC points and then packed it in despite leading after four stages. With more overlap between the sprinters and distance skiers, the eventual leaders started noticeably pulling away in the sprints and never looked back. Aino-Kaisa Saarinen, leading after four stages, couldn’t quite hold off Kowalczyk, Majdic or Follis. As this year’s Tour progresses, I’ll try to present some more versions of these types of graphs, highlighting specific skiers or groups of skiers. Posted by Joran on Thursday, December 30, 2010, at 1:23 pm. Filed under Uncategorized. 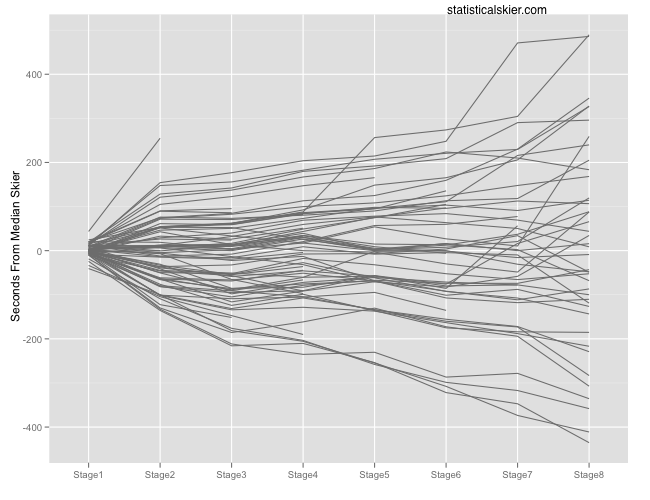 Tagged bump chart, tour de ski, World Cup. Follow any responses to this post with its comments RSS feed. You can post a comment or trackback from your blog.